-10- We were much favored to declare the unsearchable riches of Christ; and met with much openness in the people to receive the truth. 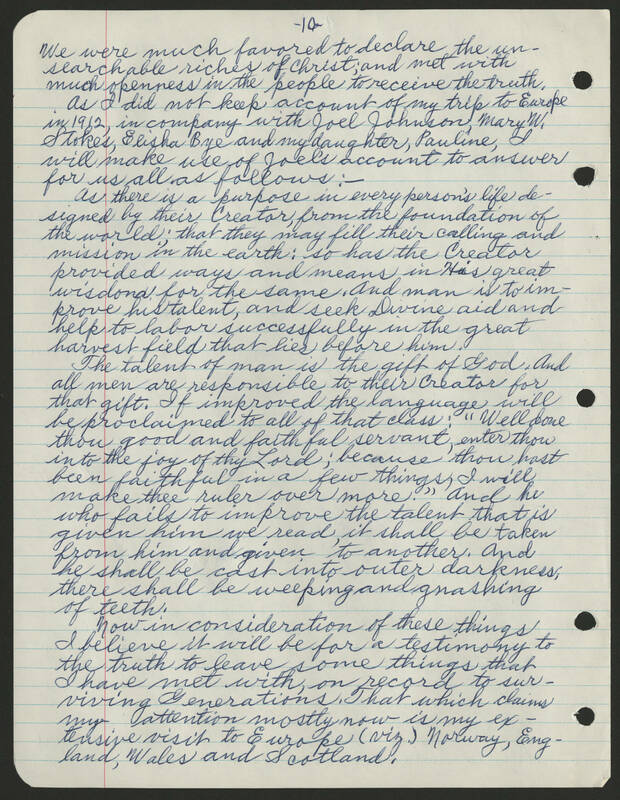 As I did not keep account of my trip to Europe in 1912, in company with Joel Johnson, Mary W. Stokes, Elisha Bye and my daughter, Pauline, I will make use of Joel's account to answer for us all as follows:-- As there is a purpose in every person's life designed by their Creator, from the foundation of the world; that they may fill their calling and mission in the earth: so has the Creator provided ways and means in His great wisdom for the same. And man is to improve his talent, and seek Divine aid and help to labor successfully in the great harvest field that lies before him. The talent of man is the gift of God. And all men are responsible to their Creator for that gift. If improved the language will be proclaimed to all of that class: "Well done thou good and faithful servant, enter thou into the joy of thy Lord; because thou hast been faithful in a few things, I will make thee ruler over more." And he who fails to improve the talent that is given him we read, it shall be taken from him and given to another. And he shall be cast into outer darkness, there shall be weeping and gnashing of teeth. Now in consideration of these things I believe it will be for a testimony to the truth to leave some things that I have met with, on record to surviving Generations. That which claims my attention mostly now is my extensive visit to Europe (viz.) Norway, England, Wales and Scotland.